You are thinking of filing for divorce or the process is already underway. What will happen to your house? Other assets? Even if a pre-nuptial agreement was executed prior to your marriage, legal and financial issues relating to property division may still arise. If you never had a pre-nuptial agreement, the stakes may be even higher to protect your rights and claim the property and finances that are rightfully yours. A marriage is more than just sharing a life with another person: investments are jointly made, material items are purchased, money goes into property maintenance and repair, and income and property are mixed. The division of property is not as simple as drawing a red line down the center of your home. How property is divided in divorce is defined in specific ways, depending on the duration of the marriage as well as several other intricate factors. Moreover, conditions surrounding child allocation, child support, and spousal maintenance may also play a role in determining the division of property. For instance, the spouse who is given physical or sole allocation of the children may be given ownership of the family home in order to provide a secure and healthy living environment. How Is Property Divided in Illinois? Illinois is an equitable division state. Equitable doesn't mean equal. As stated in the Illinois Marriage and Dissolution of Marriage Act, marital property refers to any property obtained by either spouse after their marriage. Non-marital refers to property owned prior to the marriage; property obtained by gift, legacy, or descent; property gained in exchange for property acquired before the marriage or through gift, legacy, or descent; property accumulated by a spouse after a judgment of legal separation; property specifically excluded by a legal agreement between the spouses; and any property acquired by judgment given to one spouse from the other. The court is responsible for assigning each spouse's non-marital property and will split the marital property without taking martial misconduct, such as adultery, into consideration. Property will be divided based on many factors. Each spouse’s contribution to the acquirement, maintenance, or increase or decrease in value of the property is examined. Assessing paperwork and evidence may be necessary to prove these distinctions, as well as many other matters that the court examines when dividing assets. Tax consequences of property division on each spouse. Questions or interrogatories send to the opposing party. Requests to third parties, individuals or companies, believed to have relevant information. Documents, physical and mental examinations, depositions, and interrogatories. Consulting witnesses, such as financial professionals. Professionals are subject to subpoena for discovery purposes. Their advice may be provided in writing and available to all counsel. Information such as income, investments, pensions, other property, etc. Discovery seeks to identify all marital property. The majority of tangible assets can be easily quantified, such as bank accounts, homes, and automobiles. 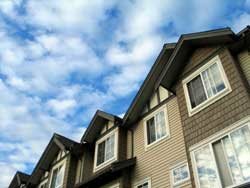 To determine the value of each piece of property, the court applies fair market standards whenever possible. The court chooses a valuation date when the value is assessed, which is done at its discretion. Intangible assets may include the value of patents, brands, or copyrights, often associated with business ownership. Within subchapter corporation distributions, where the movement of income and assets may not be visible on traditional financial reporting documents. Deferred compensation arrangements and stock allocations; common among executives. In off-shore financial accounts, which may have initially been established to avoid taxation. Pension benefits are generally deemed to be marital assets subject to equitable division. These may include accounts addressed under the Illinois Pension Code, defined benefit or contribution accounts or plans, and IRA accounts. Stock options, or stock that is not transferrable until other conditions are met, are generally considered marital property, although division may not actually occur until a future date. When there are existing life insurance policies, the court will assign rights for death benefits and the responsibility for the continued payment of the premiums. 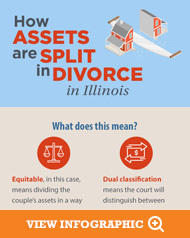 Sorting through the complexities surrounding how marital property will be divided requires the legal skill and persistence of a Chicago family law attorney who has seen it all. At Nottage and Ward, LLP, our Illinois property division lawyers will help evaluate marital property and non-marital property to ensure that you come out of your divorce with no less than what you deserve. In fact, we want you to get more. Securing your financial future is what we do. Contact us today at (312) 332-2915 for more information. What Information Is Disclosed In A Financial Affidavit? Chicago Marital Property Division Lawyer Disclaimer: The legal information presented at this site should not be construed to be formal legal advice, nor the formation of a lawyer or attorney client relationship. Any results set forth herein are based upon the facts of that particular case and do not represent a promise or guarantee. Please contact an attorney for a consultation on your particular divorce matter. This web site is not intended to solicit clients for matters outside of the state of Illinois.